Jason Billington was born and raised in Amsterdam, New York. Jason served his community as a Volunteer Firefighter and was quickly promoted to the rank of Lieutenant. In 2010 he became an EMT, after attending Fulton-Montgomery Community College for his training. 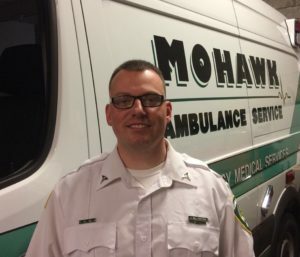 Jason joined Mohawk Ambulance Service in July 2012 as an EMT, and was soon promoted to Driver. Jason proved himself to be a vital asset through hard work and dedication, and was promoted to Field Training Officer and Driver Trainer. Jason continues to strive to improve his skills and the skills of his co-workers. Jason enjoys serving the community and spending time with his family. Jason is planning to attend Paramedic School in the near future. Mohawk Ambulance Service is proud to honor Jason as an American Ambulance Association 2017 Star of Life. Since joining Mohawk, Jason has been recognized with Distinguished Service Awards in 2014 and again in 2016.